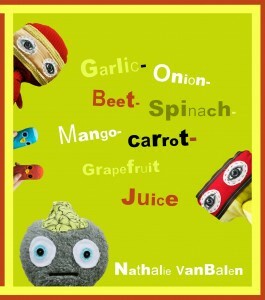 Garlic- Onion- Beet- Spinach- Mango- Carrot- Grapefruit Juice is a fresh, one-of-a-kind book designed to get a person’s mental juices flowing about compassion, vegetarianism, stereotypes, expectations, and (of course) juicing. Like the title, a lot of interesting ingredients get blended together in this book; and although it sounds funny, it sure gets one “pumped!” (like the main characters say). 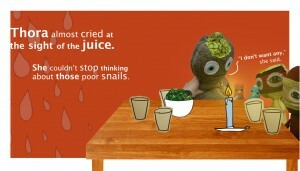 The story revolves around two characters who are super enthusiastic about juicing. 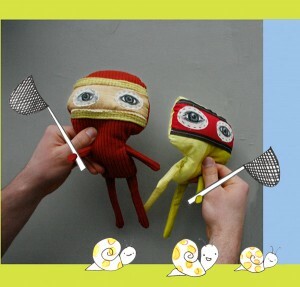 They find a reference to using yellow spotted snail shells to make them strong and healthy (and it goes well with juice! ), so they bag a bunch and prepare to add them to their special garlic- onion- beet- spinach- mango- carrot- grapefruit juice. 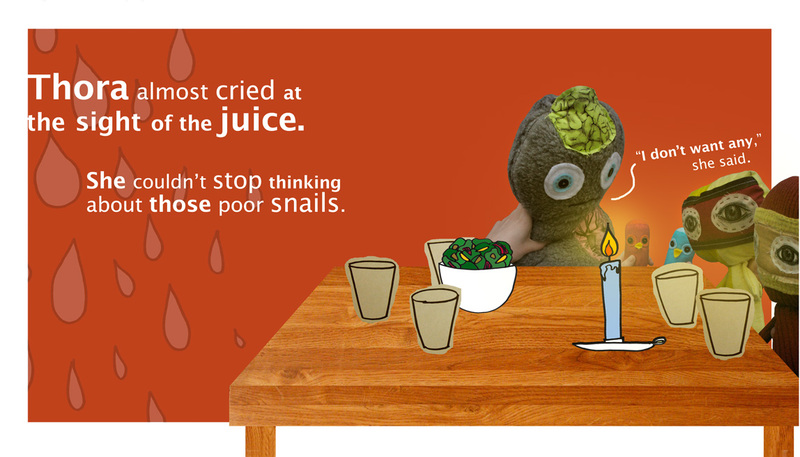 One of their housemates firmly believes snail shells do not belong in juice and begins thinking about the snails’ perspective and models critical thinking, empathy, and compassion for the reader. She asks herself thoughtful questions, one of which is “How does it feel to be food?” She discovers she does not know how to talk about her thoughts with her friends. When she comes down to the dinner they fixed, she is almost in tears upon seeing the juice on the table. Of course there is a huge surprise at dinner when the story takes an unusual but fun twist. Nathalie VanBalen creates an active and engaging story with a lot of bold and dynamic text interspersed with memorable (yet somewhat disturbing) characters. There are pages filled with only pictures, pages containing only one large word, as well as pages utilizing both staggered text and images to create an energetic pace and reiterate the characters’ vibrant personalities. Thora, a very thoughtful (literally) character, appears a cross between an Uglydoll and a zombie while the two metal-music-loving-Viking characters actually remind me of a mixture of ninjas and Bill & Ted (and their Excellent Adventure). This book is vegetarian-friendly (and vegan- and raw food- friendly) with a clear message about compassion and a social dilemma a person might face with friends or family regarding food and animals. Quirky humor is present in the references to health benefits and it isn’t frequent that a children’s book mentions the words kale, “protein, calcium, potassium, magnesium, and vitamins…” in such a fascinating way. I like the implied message that people need to come to their own conclusions about what they eat and that it is ok to not know the answers. For such a fantastic book, it hits on the real question: how do we teach others compassion? My daughter loves this book — she says it’s both “really funny” and “really sad.” And I like the message.